The weight, volume or size of the goods measured upon shipment is valid. Prices valid at date of confirmation of purchase order will be applied. Our prices are ex works unless stated otherwise and do not include any kind of taxes or costs if applicable. We reserve the right to postpone delivery in the case of force majeure for the duration of the obstruction plus a reasonable period of recuperation. Should delivery have become impossible by an act beyond our control do we reserve the right to partially or completely rescind the contract. Strikes, unforeseeable events or interruptions of operations are considered force majeure, should we have no influence over these events. We reserve the right to partial deliveries unless the buyer has no interest in them. Unless failure to comply or delay of delivery was caused by us, our lawful representatives or auxiliary persons by gross negligence or intentional act, we will not be liable for noncompliance. Should we be liable under the terms aforementioned, liability is limited to damages that occur foreseeable and typically under the circumstances. Unless agreed otherwise, delivery is made from the seller’s premises. Goods travel at costs and danger of buyer, unless agreed otherwise. Unless agreed otherwise, our invoices are to be paid immediately upon receipt of merchandise and invoice. Should buyer fail to comply within the agreed payment terms, he will automatically be in default of payment. Payment is considered made when due amount is at our disposal. Detention of payments or balancing of payments against claims of buyer against seller is not allowed, unless these claims are undisputed or legally established. If buyer fails to make payment by due date, without prejudice to any other right or remedy available to the seller, we are entitled to charge buyer legal interests on the unpaid amount and after having received the second reminder for unpaid claims will we block all shipment of goods for running orders. Should there be reason to doubt the solvency or credit standing of the buyer, we reserve the right to demand securities or prepayment for any outstanding delivery or declare immediate maturity of all outstanding claims. Notwithstanding delivery or passage of risk in the goods, property of goods shall not pass to the buyer until full payment of all our claims against the buyer, regardless of their grounds, was made. If goods are processed or mixed by buyer with goods that we have no property in, we shall become co-owner of these goods, which shall be stored for us by the buyer. Processing or transformation of the goods is done in our name as a producer, but without obligation to us. Should we lose ownership due to processing or fusion, we will become partial co-owner ( value of invoice ) of the new product. The buyer will store the co-owned goods free of charge. These goods are called reserved goods in the following. Buyer has the right to process or sell these goods in the regular course of business, as long as payment obligations are fulfilled. Pledging or cession by security of these goods is not allowed. For safeguard, receivables based on the sale of these goods are considered fully assigned by us. Buyer authorizes us to collect them at his costs, a right that we are obliged not to exercise unless buyer fails to meet his payment obligations towards us or, particularly, institutes bankruptcy proceedings. In the case of bankruptcy or suspension of payment we have the right to demand that buyer declares the assigned receivables, gives all information and documentation necessary for us to collect our claims and informs garnishee of the assignment. Should third parties try to claim these goods, buyer is obliged to inform them of our property and immediately inform us of the intend. Buyer will be held responsible for costs and damages. The buyer shall examine the goods as required, checking the goods in every aspect and determine if goods are suitable for the intended purposes, if necessary by running appropriate tests. Claims will only be accepted if we are informed no later than two weeks after receipt of goods. In the case of hidden faults claims must be made within 6 months of delivery of goods. If any valid claim of faulty goods is made, we are obliged to either replace the goods free of charge or repair it, the choice being at our sole discretion. Buyer may choose reduction of price or cancellation of contract should our efforts fail. In case of lack of a warranted property of the goods, we shall be liable for damages on the grounds of non-compliance. The warranty does not cover damages to the goods that were caused by improper handling or storage after the passage of risk or where caused by external factors that were not foreseen in the contract. We will be liable according to Luxembourgish Law if damages occur due to gross negligence or deliberate acts by us, our lawful representatives or auxiliary persons. If the violation of contract was not caused by an intentional act, liability will be limited to foreseeable and typical damages. 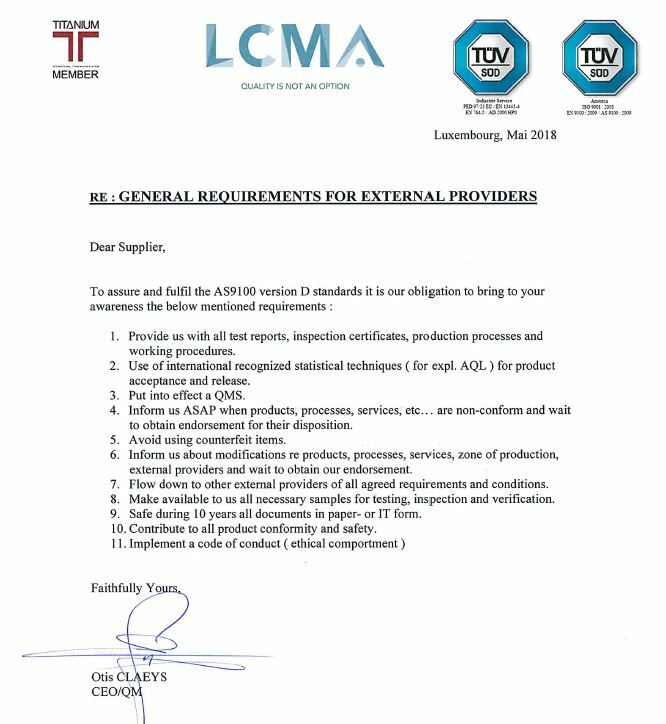 Furthermore we will be liable according Luxembourgish Law should we deliberately violate any essential duty under the contract. Any further liability is excluded, expressively for any kind of damages that occur on anything or in any way on the delivered goods itself. Our contracts are governed exclusively by Luxembourgish Laws. The application of any Law other than the Luxembourgish Law is excluded. Our technical advices are given according to our best knowledge and experience. Buyer id obliged to apply due diligence in verifying applicability of our advice to his special conditions of production or application. Concerning our technical advices, which are given free of charge, we will only be liable for damages caused by gross negligence or deliberate acts from our part or by our lawful representatives or auxiliary persons. Unless intentional violation of contract has been proven, we will only be liable for damages that occur foreseeable and typically. Place of execution and place of venue is Ehlerange, G-D of Luxembourg. We reserve the right to sue at buyer’s place of business. These General Terms and Conditions of Sales, as well as all our business relations with our buyers, are governed exclusively by the Laws of the G-D of Luxembourg. Please note that some of our goods might require exportation licence or might be subject to export restrictions. These provisions are to be observed by the buyer in case of sale or exportation of the goods. Should one of the clauses above or part of one of the clauses above le legally invalid, validity of the other clauses of these General Terms remains unaffected.